It’s not often in this world that something that’s better for our horses is actually better for our pockets too! What follows is of course the ideal – I do appreciate that not everyone has their own land and to that extent is governed by the rules & regulations of the livery yard or farm where they keep their horses. However the nearer you can get to the ideal (and sometimes this may mean ‘thinking outside the box’), the healthier both your horse(s) and finances will be. Horses are creatures of the open plains; they would never choose to go into a cave or other enclosed space because that could be a dangerous place where predators were hiding. When they emerged from the forests many millions of years ago, their legs & faces elongated because to stay alive out in the open they needed to be able to see over long distances and to be able to run fast to escape predators. Incidentally it is this elongation of the face which gave rise to the part of the jaw without teeth (the so-called bars); the place which man was arrogant enough to believe was put there specifically to accommodate a metal rod with which to ‘control’ the beast. In nature, horses keep warm by moving. How much room for movement is there in a stable? The stable represents a claustrophobic environment where the horse is isolated from the herd, very often unable to even see or touch another horse and certainly unable to move to keep warm. Additionally many stabled horses are fed ‘meals’ (often cereal-based) at intervals, rather than being allowed constant access to forage. Since horses have evolved to eat almost constantly throughout the day & night, there is a constant supply of acid to the stomach; restricting a horse’s intake of food can often lead to stomach ulcers and so-called ‘stable vices’ – weaving, crib-biting, wind-sucking, box-walking etc. 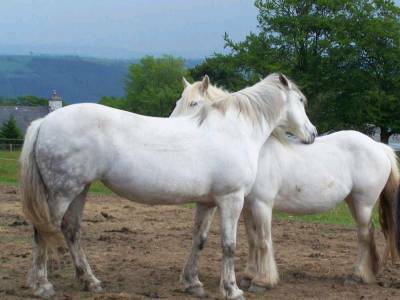 Research has proven that these stereotypical behaviours are similar to those exhibited by wild animals confined to small cages in zoos; it has also recently been proved that horses do not ‘copy’ each other in this respect – if more than one animal in a livery yard is exhibiting the same stereotypical behaviour, the immediate environment & husbandry is likely to blame; it is therefore totally inhumane to isolate a horse exhibiting such stereotypies to stop other horses copying it; the behaviour exhibited is a symptom of the horse’s stress & suffering from being kept so unnaturally and to isolate it further is incredibly short-sighted as well as cruel. Nature provided the horse with its own highly efficient thermo-regulation system – a coat which grows thicker in cold weather and thinner in hot weather and in which each individual hair has a muscle to lift it for the purpose of trapping air to further insulate the animal from the cold. Horses also keep warm by moving either voluntarily or by involuntary muscle movements which we call “shivering”; this rapid muscle movement generates considerable body heat so should not be looked upon as the horse suffering from the cold but rather enacting a vital part of its thermal regulation process. Rugging a horse compromises its body’s built-in waste disposal system and puts extra strain on internal organs such as the liver & kidneys. Most rugged horses spend their days overheated. When you place your hand under your horse’s rug the hair should never be toasty warm but barely lukewarm, even bordering on the cool side. We humans ‘rug’ ourselves up with multiple layers of clothes in cold weather but even with the slightest amount of exercise we have to remove a layer because we start to feel uncomfortable. The same applies to our horses. Rugged horses only have to walk or trot a small distance on the coolest of days and they start to overheat. This is why horses with heavy rugs deliberately restrict their daily movement due to the discomfort from the weight of their rugs and overheating. Horses have a core body temperature of 38 deg C and for optimum health this should be maintained - which they effectively do when running wild in either the heat or the cold. Picture a typical autumn or winter day – freezing overnight, followed by a lovely sunny day - temperatures can range from 0 degrees C (or less) overnight to 15 or even 20 degrees C in the day and many people are unable to visit their horse to remove the rug. Those horses are extremely uncomfortable (at best) sweating under their rugs in the sunshine and then when the cold night comes they are wearing a rug which is wet from the sweat generated in the day, and because they are rugged the hair becomes flattened and is no longer able to function as nature intended and insulate the horse from the cold. In many instances rugged horses are actually colder than unrugged ones! Rugs also harbour bacteria & fungi and many rugs will rub and cause either bare patches or sores. What about rain scald? In our experience, naturally-kept healthy horses very rarely have rain scald, whereas we have known of many cases of rugged horses having rain scald!! We are far too anthropomorphic (ascribing human characteristics to nonhumans) when dealing with our horses: we see them shivering (a natural function to generate heat) and think we must put a rug on them or confine them inside to ‘keep them warm’ (the things a human who felt cold would do), rather than allowing them to live more naturally. Firstly the mud issue – your horse should be your friend and as such deserves some quality time with you. Grooming provides a splendid opportunity to spend some quality time, before tacking up and riding out. It gives you the chance to find out how your horse is feeling today, which will ensure a safer ride out. You only need to groom the immediate areas where you will be placing the saddle, girth & bridle. If you are worried about the ‘look’ of the rest of the horse then your fluorescent quarter sheet (which everyone should be using in these days of inconsiderate drivers in too much of a hurry) will cover most of the rest of the visible area of horse. If you feel that you’re spending much more time grooming than you would if your horse had been rugged, just remember to factor in the amount of time you would have spent, on a daily basis, putting rugs on, taking rugs off, adjusting rugs, changing rugs, repairing rugs (or taking them to be repaired), cleaning rugs, selecting & buying rugs etc. Also consider the non-quantifiable improved health of your horse meaning less time off work, fewer veterinary costs etc. And if this is a turned-out horse which has previously been stabled, there is no comparison between the small amount of time spent grooming your horse compared to the daily mucking-out ritual and all that involves; I know which I’d rather be doing! The clipping issue: Lucinda McAlpine was one of the first to keep her competition & breeding horses (mix of Andalucian & Thoroughbred) ‘au naturel’. She has found her whole herd to be far healthier & happier; more trainable and able to compete to a very high standard for longer. She no longer clips because she no longer rugs and maintains that a clipped horse that sweats risks damaging the muscles by chilling since the sweat evaporates from the body far too quickly. Sweating, like shivering, is a perfectly natural function of a horse. But I hear you say “we ride out for miles and my horse gets very sweaty” – picture a herd of wild horses being chased for miles by a pack of wolves or other predator; do you think they don’t sweat up? Of course they do – it’s a natural function – leave your horse unclipped & unrugged and get grooming! The remaining points will be covered in future articles.